Cities in Iran and Saudi Arabia have the worst air pollution in the Middle East. 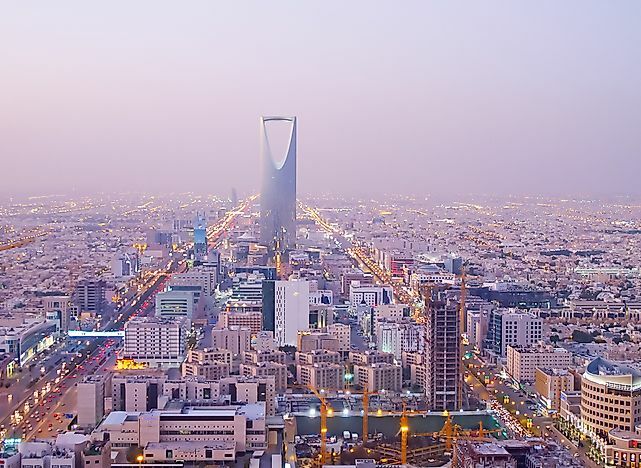 The city of Riyadh has the worst air quality in Saudi Arabia. Air pollution has reduced in the Middle East in the last few years, partly due to the Arab Spring which ended in 2012. Before 2010, the Middle East had the highest pollutant levels in the world caused by rapid economic growth. Currently, the pollution level in the Middle East varies widely with some of the major cities in Iran, Saudi Arabia, and Bahrain being the worst affected. Other than the frequent sandstorms which affect some parts of the continent, industrial emissions and vehicle emissions have contributed to the poor air quality. Air pollution issues affecting Iran have been proliferating over the last couple of years with some schools in the major cities being closed at some point due to air pollution. Zabol is the most polluted in the Middle East with an average PM10 concentration of about 527 micrograms per cubic meters which is over twenty-five times the recommended level. Other Iranian urban areas featured in the top fifteen most polluted cities include Boshehr and Ahvaz. The leading cause of pollution the strong winds from the desert and lagoons desertification in Iraq. Lack of environmental policies to help control pollution in Saudi Arabia is linked to the country's reliance on oil as a source of revenue. As the leading exporter of oil, the state contributes to various environmental issues associated with oil drillings like air pollution and oil spills. In the recent report by WHO, Riyadh was the second most polluted city in the Middle East with an average PM10 level of about 368 micrograms per cubic meters, followed by Al Jubail with 359 micrograms per cubic meters. The primary cause of pollution in these cities includes the cement plants, oil refineries, power stations, and the many vehicles being used by the locals. Other cities featured in the top thirty lists of polluted cities in the Middle East include Dammam, Yenbu, Makkah, Jeddah, and Medina. Discovery of oil in Bahrain in 1932 brought hasty modernization into the country which in return affected the quality of air in the country. The recent WHO report on global air pollution revealed that Bahrain had some of the most polluted cities in the Middle East. The most polluted urban area in Bahrain is Hamad Town which has a mean PM10 level of about 318 micrograms per cubic meters followed by Ma’ameer with 257 micrograms per cubic meters. The leading causes of air pollution in Bahrain include industrial and vehicle emissions, sandstorms, and drought. Other cities with high levels of PM10 levels include Ras Hayan, Nabih Saleh, and Hidd. Air becomes polluted when harmful quantities of substances like biological molecules, particulate matter and gasses are introduced into the atmosphere. The main source of these particulate matters includes industrial and vehicle emissions and presence of dust in the air among other causes. These pollutants cause allergies, respiratory diseases, and premature death of over a million people every year. According to WHO, air pollution caused the death of over seven million people in 2012. Over 91% of the people live in areas where air quality exceeds the recommended pollution rate. Over 80% of the residents of cities which monitor pollution are exposed to high particulate matter level.